Not many people know the A4tech Bloody gaming mice, because the bad why the brand their products. That’s a shame because they are producing pretty good gaming mice. Here we are going to test the A4Tech Bloody ZL5 gaming mouse. The Bloody ZL5 laser gaming mouse adopts the Avago A9800 High-Performance laser engine to deliver pixel-precise resolution from 100 to 8,200 DPI. And it comes equipped with 11 programmable buttons – more than enough when playing FPS / RPG games. You’ll instantly notice very specific and futuristic design of the A4 Tech Bloody Sniper ZL5 laser gaming mouse. It consists of two colors, the body is black and the front, prominent part is silver. Kind of make a good contrast. There is bright red LED bellow scroll button, which makes it more interesting in the dark. A lot of programmable buttons, 11 to be specific, are positioned on the sides and on the top of the mouse. Buttons are easily pressed and feels all right. You can say that it has a really nice design. It depends on your taste whether you will like it or not, but probably most of the buyers will like it for its design. For me, it has a very comfortable shape and surface to it. It has nice materials to it which makes it feel solidly built. Moving and sliding mouse on the pad is extremely easy. It feels light. The Bloody ZL5 gaming mouse has many specific features, and these are most interesting for gamers. The has an Avago A9800 high-performance laser engine to deliver pixel-precision from 100 CPI up to 8200 CPI resolutions. It has 6 Sniper Modes which can be selected to upgrade sniper skills rapidly and switch swiftly between the “rifle“ and “sniper“ modes to shoot targets instantly. 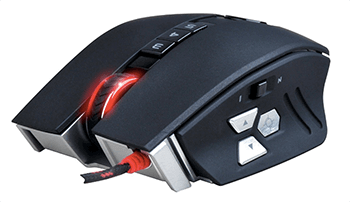 This mouse uses ultra-durable Omron Micro Switches with a lifespan of over 20 million clicks for the left/right mouse buttons. Gear-Style Weapon Switch – instantly shift between 5 shooting modes to suppress enemy assault with superior firepower! 11 Programmable Buttons- adequate for playing FPS shooting games with 4 shooting modes in left button, or playing MMO/RPG on-line games for quick execution of macro commands. High-grade soft-rubber design – Abrasion and sweat resistant Left/Right buttons reduce shaking and improve target accuracy! Innovative “16-Grade Calibration Technology”, fine-tunes the focus between the laser-grade engine and the texture of the working surface. This enables better cursor positioning and outstanding working surface adaptability. Exclusive Metal X’Glide Armor pads are frictionless, durable and wear-resistant. The smooth surface enhancement makes your mouse glide 20% faster and last more than 300 Km of traveling distance. The Bloody ZL5 has an Avago A9800 high-performance laser engine to deliver pixel-precision from 100 CPI up to 8200 CPI resolutions. It is fast and responsible and no lag can be felt. Also, it has very high accuracy. It is best for FPS games just because of this. The fast and responsive sensor is one of the most important things on a gaming mouse. 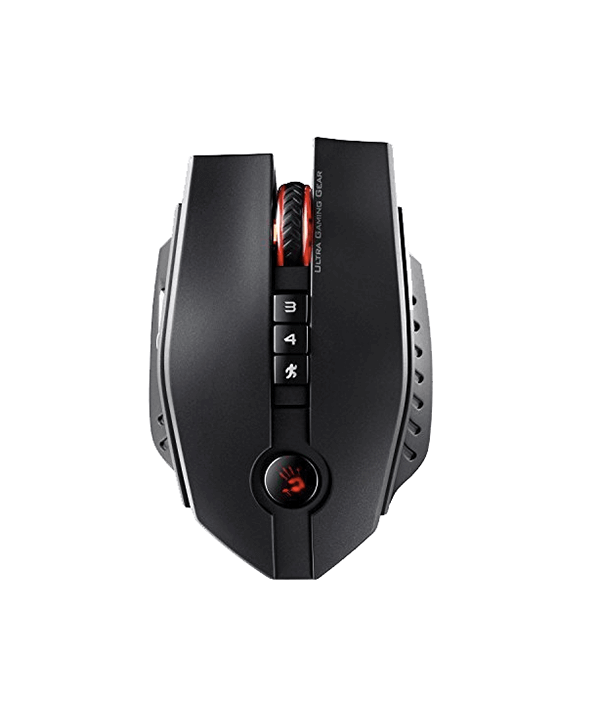 The software provided with the A4Tech Bloody Sniper ZL5 gaming mouse has many detailed features and settings. It can help you to program all the buttons as you wish. And I kinda like the software. Big plus for that. If someone has a low-budget but still needs a mouse that can be used for gaming, this is it. This is the best mouse at its price. It is durable and can be used for a long time if someone needs it to last. This mouse is made mainly for FPS games and has 5 shooting modes, and you can easily tell which one you are on by color changes. 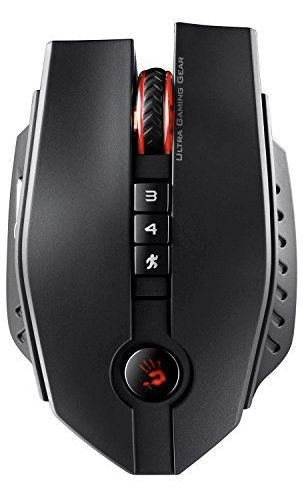 This mouse also cheats in a few ways, as this has auto-suppression and auto recoil, although this is not really considered cheating in games, but is frowned upon by the gaming community. No one can compare this mouse with ultra gaming mice from Razer, Thermaltake, Steel Series or any other big gaming brand, but this is definitely the best mouse at its price. A4 Tech Bloody Sniper ZL5 laser gaming mouse can get very positive recommendations especially when you consider £25-30 price mark.